Autumn colors found around the Village of Baldwinsville, New York. Autumn was muted this year. The long, hot and dry summer really stressed the trees and the fall foliage showed it. Many trees which normally turn bright red this time of year went going directly to yellow or brown. There was color to be sure and I went out in search of it around my hometown a couple of weeks ago. The staghorn sumacs leafs which, are one of the first to change color each year, were still hanging on next to the bright red fruit. I found other splashes of color (or colour) in the landscaping of homes which I photographed from the sidewalk (right, Karma?). To my friends, family and bloggers living on the eastern coast of the United States, stay safe as Hurricane Sandy morphs into Frankenstorm. The rain and winds expected here should remove most of the remaining leafs on the trees. 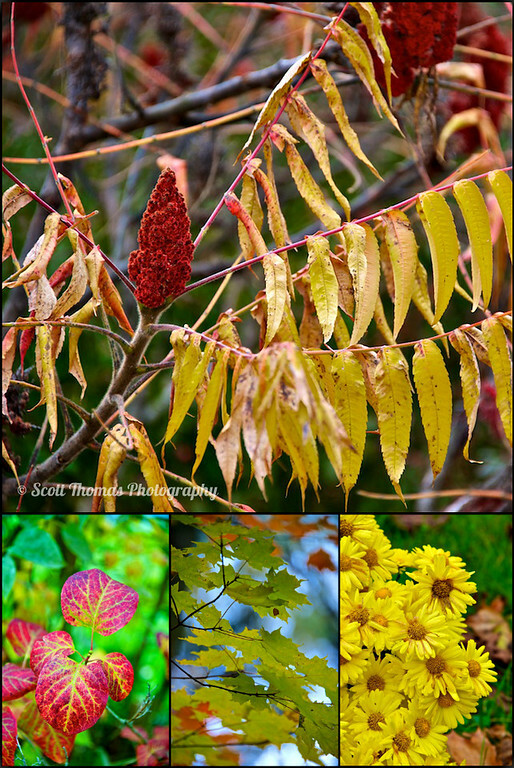 This entry was posted in Nature, Weekly View and tagged 28-300mm, autumn, baldwinsville, flowers, leafs, leaves, maple, new york, nikon D700, red, staghorn sumac, tree, vr, yellow. Bookmark the permalink. Maybe that should be my next photo hunt (I was a slacker this month and didn’t think of one) – sidewalk photography, lol! Photos “stolen” from the sidewalk! I agree that the colors seemed muted this year. The trees all seemed to change at different times and we didn’t really end up having one of those big colorful displays. You stay safe too, Scott. School was cancelled here today and I am trying to enjoy having electricity and internet service while I can. That’s how it was around here. No one time when all the trees were colorful. Reason for getting in close for these detail photos. Hope you had a nice day off without power loss. We had gusty winds and rain but nothing too severe. Thanks, Truels. It wasn’t as easy as in previous years but Nature is bountiful.